Gluten-free options in restaurants have proliferated in the past couple of years, and it's no longer difficult to find a decent, safe gluten-free meal when you're dining out. In fact, multiple chain restaurants offer gluten-free menus. However, it can be tricky to find a local restaurant that serves gluten-free food when you're traveling, especially if you prefer to avoid the big chains (or if you want to enjoy some local color and flavor). In addition, you may just be looking to broaden your horizons and try something new locally. That's where gluten-free restaurant apps and sites come in. These listings—most of which you can access from apps on your phone—can help you narrow down your gluten-free options and zero in on a great new restaurant. • The Gluten Intolerance Group's Gluten-Free Food Service Certification Program. This program teaches restaurants how to serve safe gluten-free meals, and then promotes them on its website. Once you venture beyond major metropolitan areas (such as New York City), the listings contain mainly chain restaurants with gluten-free menus. However, the restaurants included in the program do provide reliably gluten-free meals. • Find Me Gluten-Free. This is another crowd-sourced restaurant and business guide with worldwide coverage, a website and a free app. It's quite comprehensive and includes many off-the-beaten-track restaurants that you might not have guessed would be celiac-friendly or would have a gluten-free menu (I found a local pancake house listed that never would have caught my attention otherwise). It also includes some photos of menus, which is a useful touch. Again, because this is crowd-sourced, always discuss your needs with the manager or chef. • Gluten-Free Registry. This crowd-sourced directory app includes restaurants, caterers, grocery stores, bakeries and other businesses that cater to people looking for gluten-free food. It includes multiple restaurant listings and reviews, including both chain restaurants with gluten-free menus and a significant number of local restaurants with gluten-free options. Just one caveat: This is crowd-sourced information, so as always, your mileage may vary. Definitely verify the gluten-free status of your meal with restaurant staff members before digging in. • Gluten-Free Travel Site, another crowd-sourced website and app, includes user-submitted gluten-free dining and travel reviews of restaurants, hotels and grocery stores. It has thousands of reviews, including many from outside the United States, and is searchable by geographic location, worldwide. You can narrow down your search by zip code or town and have the results displayed on a Google map, from which you can click through to the reviews. Once again, this website relies on users, so verify everything. But its worldwide focus definitely will come in useful when traveling. • Allergy Eats. This site, started by a man whose children have severe food allergies, isn't purely gluten-free; it deals with all allergies, which might make it suitable for people with celiac disease or non-celiac gluten sensitivity who have additional food allergies or intolerances. You can search by address and by allergy ("gluten" is included as an allergen). Again, this is a crowd-sourced listing, and it's important to emphasize that not every restaurant included on the lists can prepare a gluten-free meal. In fact, it's not always clear which ones have gluten-free options and which ones do not. The user reviews should help you narrow down your options, but you should probably call the restaurant prior to visiting, as well. • Triumph Dining's Essential Gluten-Free Restaurant Guide. Finally, if you want to do this the old-fashioned way: This print book has been my constant companion on the road for several years, and it's paid for itself many times over. I still think it's one of the most comprehensive listing of gluten-free restaurants around, and the folks at Triumph Dining take great care to verify the information in it. It does have one drawback: it's not available in electronic form. But it's so useful, I don't mind carting the book around. 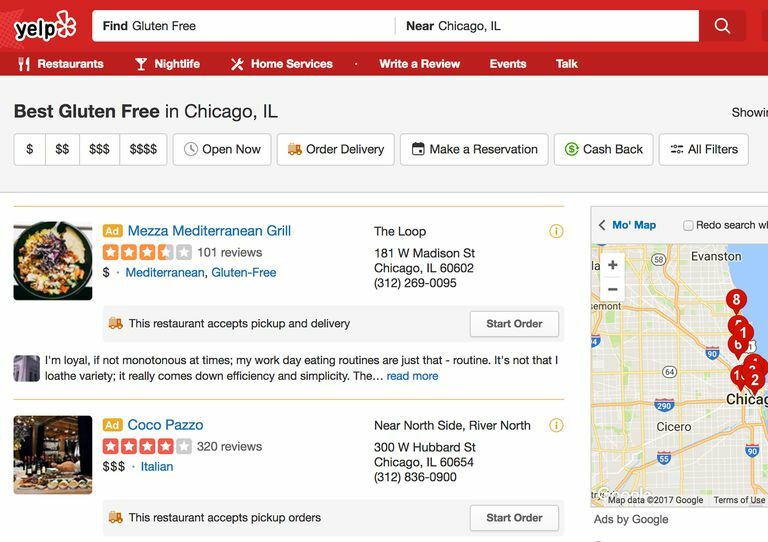 Restaurant apps like Yelp, FourSquare, TripAdvisor, and Zomato (formerly Urban Table) all allow you to search for "gluten-free restaurants" or "restaurants that offer gluten-free menu options" in a specific location. This obviously can be very helpful when you're on the road in an unfamiliar area and just want a quick (but safe) bite to eat. You'll need to be careful, however: the computer-generated lists produced by these apps merely compile mentions of "gluten-free" in reviews from other people. Because of this, they'll not infrequently list restaurants that don't have gluten-free options, merely because a customer said something in a review like "this restaurant really lacks gluten-free options." In other instances, you'll find someone ordered and was served a "gluten-free" meal, but then says she got sick from it. So the bottom line when using these popular, common apps is to do your own due diligence. Don't just assume that any restaurant listed truly can serve gluten-free food—read the reviews carefully before you make a decision. In some cases, you'll turn up hidden gems (a Chinese restaurant that uses gluten-free soy sauce to make everything on the menu, for example). But in other cases you can get burned if you just do a quick read and fail to get into the details. While these sites and apps can help you find a great restaurant prospect, there's really no substitute for doing the on-the-ground work needed to keep your meal truly gluten-free. Even if you're ordering off a gluten-free menu (and especially if you aren't), you'll need to stress the need for the restaurant to double-check every ingredient and to avoid gluten cross-contamination. Gluten-Free Fast Food: What Are Your Options? How Do You Dine Out While Gluten-Free? Do Meal Delivery Services Offer Kits Safe for Gluten-Free Diets?